Lawn Aeration is Necessary to promote a healthier root system and remove damaging ground waste. The roots of plants needs water, nutrients and ....oxygen. This is the process in which of soil are thatched and punched which opens of the soil and allows water, nutrients and oxgen to penetrate the ground. Yeilding a Healthier soil and stronger root system. This procedure is done with a aeration machine which will break up the turf and remove plugs of dirt from 1-3 inches of depth. The holes will aid in the growth of grass and deep root system. This procedure is done by calculating the quality of new seed to apply to a lawn. A Mechanical device such as a broadcast spreeder or a drop seeder may be used. The spreading of the seed will be several diffrent directions to ensure seed reaches the soil and holes from aeration. 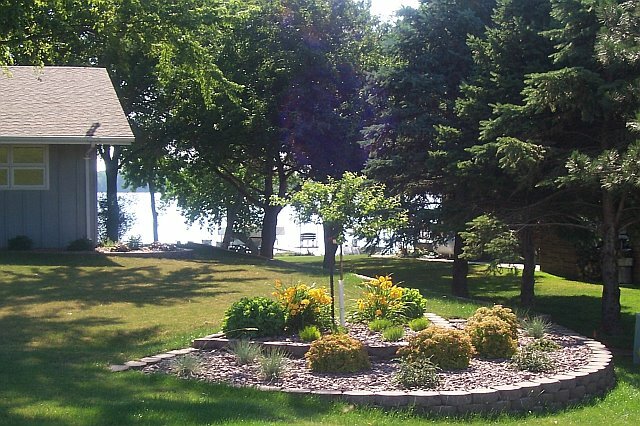 "Aeration and Overseeding are the key components to build a desirable lawn. Aeration should be done in the fall to obtain the best results." Not sure if Aeration and Overseeding is right for you... Call Your Lawn Care Crew and let them make the right choice for you. The Core areas will be mowed as often as needed to maintain a neat apperance at all times. The amount of cuts will vary based on weather conditions through the growing season. Roberts Lawn Service recommends mowing to be done on a weekly basis for most properties and every five days for excessive growth of healthy lawns. The cutting height will not be less than 3 inches for most turf to avoid scalping, Included with the basic lawn maintenance is Weedeating, Blowing sidewalks, driveways, patios and paved areas. No single material is the best "all-purpose" mulch for every job. The Locations most often mulched include landscaped areas with trees and shrubs, perennial borders, annual flower beds and vegetable gardens. Matching Materials, mulch depth and timing of application to the specific areas in your yard can ensure you get the most benefits from mulching. Sometmes it is better to just start from scratch, Sod Installation is the way to go. you can start fresh with a completely luscious sod installation that will make you property a diamond in the rough. Our Crew comes out to your site fully prepared to trim all shrubs and trees on your proerty. All walkways and curbs are edged as needed. Tree rings and mulch beds can be edged as well to provide good definition from grass and mulch. This procedure is maintained by weeky weedeating. This Service is a cleanup to begin the mowing season and to mulch up any exsisting leaves and to clear debris from mulch beds and pick up sticks and limbs. This service may include much of the same as the spring cleaup with extra attention to leaf removal and cleaning of gutters if requested.